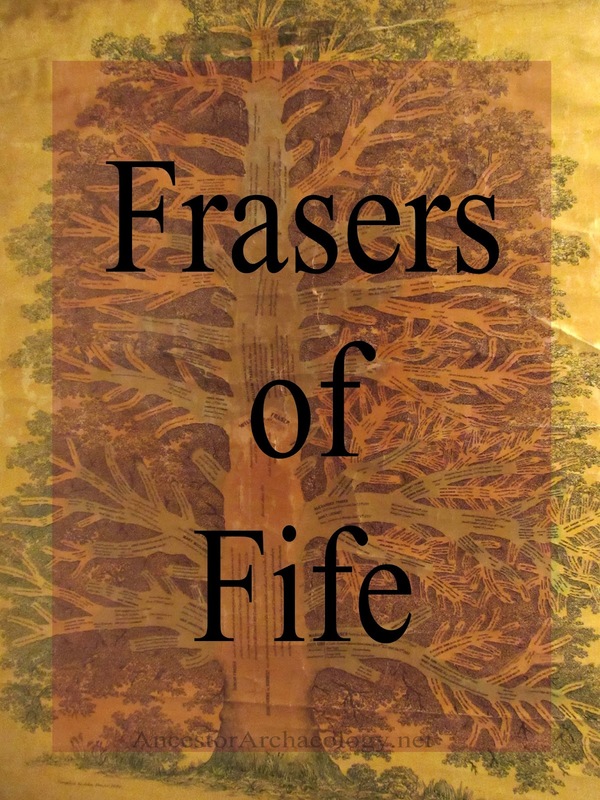 Ancestor Archaeology: Frasers Of Fife: And Then There Were Three! A third tree has surfaced! As you may recall, I originally believed I was in possession of a unique document, an original one-of-a-kind Family Tree for the Duncan Fraser ~ Isobel Burness union. Then, my research illuminated the truth that there were at least two others out there - one I found mention of on an old (1999) chat log on RootsWeb - emails to the author, "P. H.", have still to this day gone unanswered. I suspect she resided in the US, where however, I am not sure - I hope as I work my way through the entire tree I will discover where she fits in. 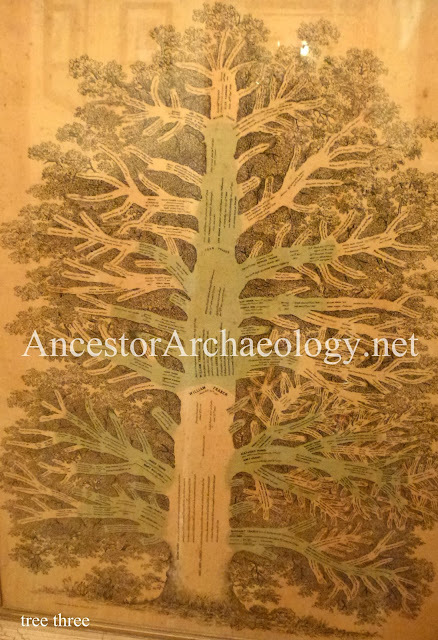 The other tree I discovered documented on Ancestry. What an exciting day that was! 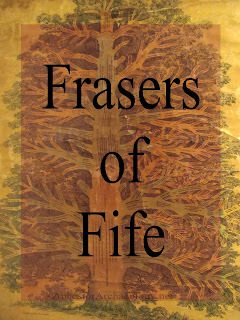 The owner of that tree, a Fraser, resides with his tree in England. We correspond frequently and are now collaborating to bring the Tree into the 21st century. Then it happened - that 'cousin bait' everyone talks about - I got a bite! I was contacted through this blog by a man in Scotland who has a tree that was his mother's. The exact same tree! 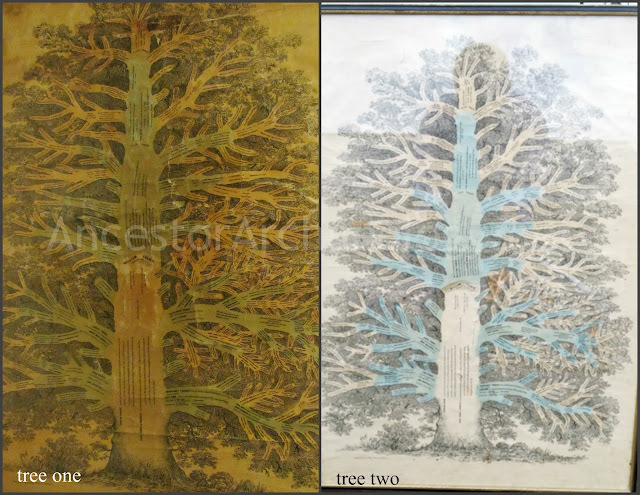 Here are the other two - mine on the left, clearly more distressed, the England tree on the right. This new 'cousin' has his origins just off the trunk on the lower right branch. He springs from the original Duncan/Isobel children. I fork off about half way up - also on the right - a sprout of a child of Duncan and Isobel. Our other 'cousin' is all the way at the top of the tree - the offspring of a second generation descendant of Duncan and Isobel. Quite the variety! And there are lots and lots of branches on that tree. The mind boggles imagining just how many trees could potentially be out there. I'll keep plugging along, documenting the work John Fraser did in 1880 - I have what John did not, I have the help of the amazing newfangled invention, the internet! He, on the other hand, had the advantage of being 137 years closer to the origins of the family. One thing that bemuses us all .... what's up with the blue/green coloring on selected branches? One theory, those are the families that received a Tree. That remains to be seen, but it's a curious mystery for sure. Maybe the blue green parts are for the information that was known for sure. How exciting to have found other branches with the same tree!